Love and Dreams cabin is located on the top of a mountainous, secluded gravel road surrounded by forest. You will enjoy breathtaking views on your way up there and may even catch a glimpse of some wildlife. Relax and unwind in our newly redecorated cabin and enjoy all the comforts of home while surrounded by the beauty of the mountains. The bedroom as well as the living room is equipped with TV, DVD player and Direct TV. 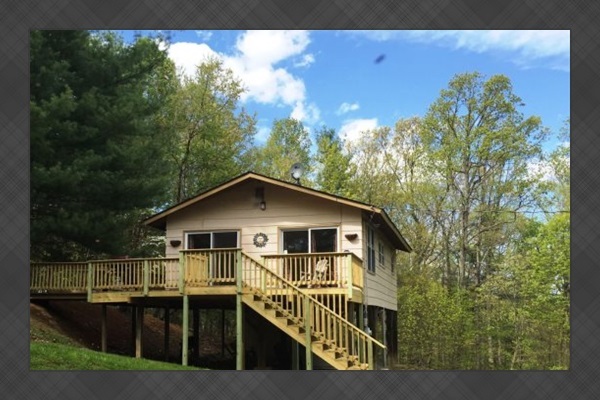 After a day on the Shenandoah River or hiking or horseback riding through the nearby GW National Forest, relax in the four person hot tub or pick up some firewood and sit in front of a roaring campfire roasting marshmallows. Luray Caverns is located 8 miles away and there are several nice vineyards in the area. Please be advised you have rented a mountainous property. The main and secondary roads are usually paved. However there are many side roads that are gravel or hard packed dirt surfaces. You may experience potholes, ruts, steep inclines and rough terrain. Most front wheel drive vehicles have no trouble accessing their property from these roads as long as you drive safely and slowly. We do not recommend low profile vehicles such as sports cars or motorcycles. During inclement weather such as snow or ice you may be required to have 4 wheel drive or tire chains. We also recommend Travel Insurance during winter months. We do not give refunds for road conditions that are out of our control. We strongly recommend a 4 wheeled drive vehicle or a truck to access this property during all seasons.